The cat does not offer services," William Burroughs wrote. "The cat offers itself." But it does so with unapologetic ambivalence. Greet a cat enthusiastically and it might respond with nothing more than a few unhurried blinks. Later, as you're trying to work, it will commandeer your lap, keyboard, and attention, purring all the while. A cat will mew at the food bowl in the morning and set off on a multiple-day trek in the afternoon. Dogs are dependent on us to the point of being obsequious, but cats seem to be constantly reëvaluating the merits of our relationship, as well as their role in domestic life. "Are cats domesticated?" is one of the most frequently Googled questions about the animals, based on the search engine's autocomplete suggestions. It's a question that scientists have been asking, too. The latest answer, based on insights from recent archeological discoveries and genome-sequencing studies, is that cats are semi-domesticated. Conventional wisdom holds that the ancient Egyptians were the first people to bond with the cat, only four thousand years ago. In 2004, however, a team of French researchers working in Cyprus unearthed the ninety-five-hundred-year-old remains of a human and a cat buried side by side. Last year, an analysis of cat bones and teeth from a fifty-three-hundred-year-old settlement in China indicated that the animals were eating rodents, grains, and the leftovers of human meals. It appears that, following the advent of agriculture, wildcats in the Near East and Asia likely began to congregate near farms and grain stores, where mice and rats were abundant. People tolerated the volunteer exterminators, and wildcats became increasingly comfortable with people. Whether this affiliation began five or ten millennia ago, the evidence suggests that cats have not been part of our domestic domain for nearly as long as dogs, which have been our companions for perhaps forty thousand years. 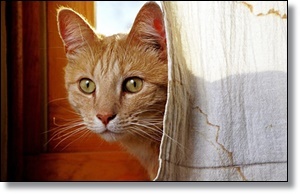 To read more on this story, click here: Are Cats Domesticated?